Erosion Control by Oliver Brown Ltd. We have extensive industry experience in the erosion control techniques listed below. We offer practical advice and will be happy to discuss your requirements in further detail. OBL prides itself on the ability to provide effective erosion control solutions to each and every client with all members of staff CSCS, CPCS, ROLO, NPORS, CTA and NPTC certified. What is a combination erosion control system? Combination erosion control systems make an excellent choice when it comes to preventing the movement of soil caused by rainfall, snow, ice, irrigation systems, and other natural elements. The combination of matting such as Futerra TRM that is infilled with mulch products creates the Green Armour system. Not only does erosion control prevent the movement of the actual soil, but it also prevents the movement of small particles and nutrients which enhances the quality of the soil. The combination of a matting material that is hydraulically infilled with mulch provides permanent erosion control, with a lifespan of 100+ years. The mixture effectively creates a double barrier when it comes to preventing soil and particle loss. When it comes to erosion that is caused by high winds and extreme water flow, the rigidity of the matting combined with the density of the mulch provides unparalleled protection. It will also help to create a higher density turf thanks to the fact it doubles the speed of germination. Where can combination erosion control be used? All landowners should consider combination erosion control for land decisions, particularly with land that is susceptible to erosion. Taking into account factors such as rainfall, average wind-speed, location, and gradient of the land, a combination erosion control method can be matched to site-specific requirements. Combination erosion control systems are extremely effective and hardwearing, and will not unravel, crush the soil, or tear. They are almost 100% effective at reducing soil loss, and particularly lend themselves to high banks and areas open to the elements. 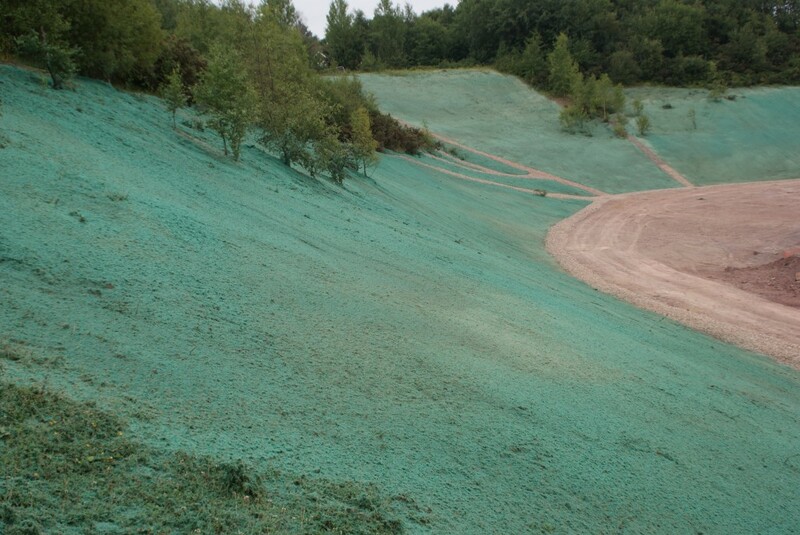 Whether through hydroseeding, development or construction, large-scale processes such as these can lead to significantly increased erosion rates, which can have negative effects on both a site and the surrounding environment. Erosion control on sites should always be kept in consideration. This is not just because erosion can make slopes and embankments unstable, which directly impacts any recently built structures, but because erosion can result in the destruction of ecosystems, degraded water supplies and increased flood hazards. At Oliver Brown Ltd., we have extensive industry experience in erosion control techniques including, Hydraulic Erosion Control, Hydro Mulching, Reinforced Hydroseeding Solutions, Soil Run Off Systems, and Dust Control. While we will be happy to discuss your individual site-specific requirements in further detail, there are some are basic principles of erosion control which can be followed. The most important function when monitoring erosion is to keep the soil on your site in place. This requires that you limit vegetation removal where possible, and cover bare soils by seeding and covering with straw. While these are effective, additional measures are necessary when working in a sensitive habitat or on a steep slope, for example. Erosion control blankets or matting are typically best applied on steep slopes and can be used to cover soil after seeding has taken place. More information can be found here. Sediment control is essential, but should be recognised as a back-up to erosion control. If erosion control measures fail, sediment control measures are designed to capture eroding soil and keep it on site – preventing further damage to the surrounding environment. An example of this could be using straw rolls on slopes or at the bottom of slopes, or you could use silt fences at the bottom of slopes – permitting they don’t impact drainage on the site. In other circumstances, gravel bags, particularly around drainage inlets, are popular and effective. However, remember that these measures are not meant to prevent erosion. Instead, they should act as a secondary defence to erosion control, capturing sediment and soil that has eluded erosion control measures before it can cause any damage to surrounding areas. Specific information on solutions and products which can be applied to your site can be found here. Leading on from the importance of sediment control, you should consider a secondary issue to erosion control – water on or surrounding a site. To prevent soil erosion, it is essential to control stormwater and keep it away from bare soils. The first and most effective method is to find a vegetated area that can withstand increased runoff. Then, runoff can be diverted from any bare soils and newly disturbed areas. However, when dealing with a large amount of runoff water, OBL would not recommend it be concentrated in one area. Instead, identify multiple locations which would be suitable for drainage, ensuring your development and the changes to the runoff pattern won’t cause additional erosion after construction is completed. Practical solutions to this provided by Oliver Brown Ltd. can be found here. Given that each site is unique and most problems require specific solutions, it is important to continually check on the measures you’ve put in place, particularly when there is heavy rainfall. By prioritising these measures on site, you should be able to spot areas that may need additional reinforcement, or require different erosion control methods entirely. Further maintenance should not be seen as a hindrance. This is because such methods—such as regularly clearing out silt that has built up around silt fencing or drainage inlets—not only help the ability of the erosion control measures, but also ensure the success of your project and help reduce its impact on the site and the surrounding environment. For more advice, contact us. As the UK’s premier Hydroseeding and Erosion Control contractor, we can offer practical advice and will be happy to discuss your requirements in further detail.